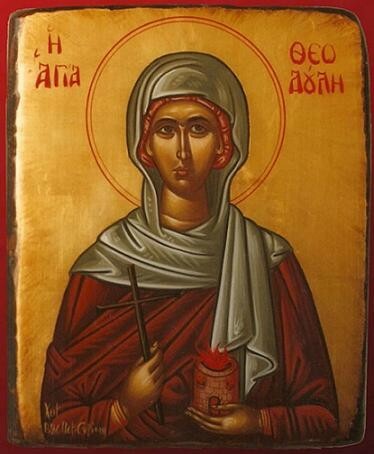 The Holy martyr Theodula lived in the city of Anazarbus (Asia Minor) during the reign of the Roman emperors Diocletian (284-305) and Maximian (305-311). The prefect of the city, Pelagius, was a very cruel man. His servants sought out Christians throughout the entire region and brought them to trial, where which the imperial edict was read to them, and they were ordered to worship idols. One day they brought to him a Christian woman named Theodula. She was afraid, not so much of the tortures, but that she might be defiled by the pagans, and so she had offered them much gold. However, the servants would not accept the gold, and they brought her before the prefect. Pelagius asked her name and he ordered her to worship the pagan gods. He threatened her with cruel tortures if she refused. St Theodula replied, "I am a Christian. My very name means "servant of God," and so people call me Theodula. I worship the One True God and will not worship a mere stone." Pelagius became furious and he gave orders to begin the tortures. The Lord granted Theodula His help, and she did not feel any pain. Pelagius, however, said this was done by the gods, who had spared Theodula in the hope that she would turn to them. St Theodula said to the prefect, "Where are your gods, who spare me? Show them to me, that I might show honor to them." They brought her into the temple of the "deified" Roman emperor Hadrian, whom they regarded as a mighty god. The saint however, in praying to the One True God, merely blew a breath at the idol, and it crumbled into dust. Seeing this, Pelagius trembled with fright. If the idol's destruction was reported to the emperor, he himself would be thrown to the wild beasts. He fell down at the feet of St Theodula, begging her to restore the idol, and promised to accept Christianity. The saint prayed to the Lord Jesus Christ, and the idol again stood in its place, whole and intact. The prefect Pelagius, however, not only did not keep his promise to become a Christian, but instead he began to torture the martyr with an even greater fury. During these torments a certain fellow named Helladius came up to the prefect, and looking at the captives, he asked to be given the maiden Theodula, promising to make her worship the pagan gods, doing this because he wanted to ingratiate himself with the city prefect and to receive honors. Helladius subjected St Theodula to harsh torments, exceeding Pelagius in cruelty. The saint prayed that God would grant her the ability to persevere. She immediately received help from God and was healed. The tormentor was awestruck, and St Theodula admonished him. "Become a Christian," she said, "and attain eternal honors in the Kingdom of our Lord Jesus Christ, Who shall judge both the living and the dead and render to each man according to his deeds." By her prayers and her words, St Theodula led Helladius to the knowledge of truth. He believed in Christ and confessed the True God before the prefect. He also received the crown of martyrdom. They cut off his head with a sword, and threw his body into the sea. 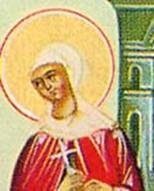 St Theodula was thrown into a blazing oven, but she remained unharmed. After this, they stretched her out on a metal plate. They poured boiling tar, wax and oil on her, but the red-hot plate shattered into pieces, and the fire scorched many people, including the city prefect Pelagius, who indeed died of fright, but St Theodula remained unharmed. 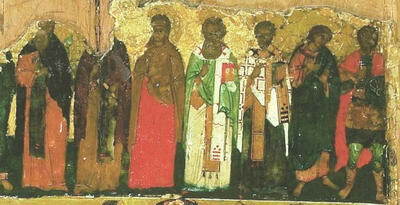 Seeing such a miracle, many people believed in Christ, among whom were the respected citizens Macarius and Evagrius. The pagans continued to torture Christians. They heated an oven and threw St Theodula, Macarius, Evagrius and many others who believed in Christ into it. They all sufferedmartyrdom, and were translated into life immortal. Through her sufferings has received an incorruptible crown from You, our God. Through her intercessions, save our souls!